Permanent makup eyebrow is designed for anyone who wants more fullness of the brows or who suffers from Alopecia for a natural brow look. It is the best solution for eyebrows that are not quite perfect, saves time and money. You can save countless hours that were formally spent struggling to draw eyebrows evenly and to apply cosmetics to your skin. It saves you money because you no longer have to buy expensive cosmetic that rub off, smear, smudge and disappear after hours. In addition, it saves you the embarrassment of smeared, smudged eyeliners and brows so common with mascara and pencils or powders. Permanent makeup is the combination of the art and science of implanting pigmentation color into the dermal layer of the skin. 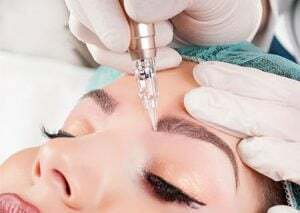 Topical anesthetic creams, that were developed especially for permanent makeup procedures, are applied to the desired area before and during the procedure to assure the most comfortable experience possible. Our Certified Permanent Cosmetic professionals use intelligent devices and hand pieces with tiny needles to apply natural synthetic pigment implant into the layer of skin known as the dermis. This technique is also used for a variety of enhancements such as eyebrows, eyeliners, lip liners, and full lips. Permanent makeup can also be used to treat skin irregularities, scars, and areolas. Our technicians are trained and certified by accredited training centers. They have the skills and experience to perform the permanent make up procedures effectively and efficiently. We use the highest quality permanent makeup machine that provides consistency. You get excellent results in less time with reduced skin irritation. Our machines are digitally controlled for accurate speed with 15 different needle combinations. They are made by one of Europe’s leading manufacturers and are praised for their safety features and smooth operation. Equipped with high precision drive, our devices offer the quietest operation in the industry. All handpieces meet international safety standards. Superior back flow protection system prevents contamination. We use highly concentrated non-allergenic, vegan friendly pigments, made in Germany. Eyebrow procedures have the least amount of swelling when compared with our other procedures. Immediately after completing your eyebrow treatment, the color will appear darker than the final result. This is because the pigment color is in both the epidermis and the dermis. The epidermis, outermost layer of skin, is always shedding and renewing itself. During the healing process, about two weeks, the color on the epidermis will flake off lightening the overall effect. Most clients lose approximately 1/3 of the color after healing. We recommend that you apply ice on and off at 15 minutes intervals during the first 24 hours to reduce swelling and hold color. The microblade hairstroke eyebrow is designed for anyone who wants more fullness of the brows or who suffers from Alopecia for a natural brow look. Those who used to apply brows by pencil, can go swimming, play tennis or wipe their forehead without the embarrassment of losing their eyebrows. Because microblade eyebrows are permanent, you save the time and money no longer wasted on pencil or other expensive temporary cosmetic applications. The microblade hairstroke eyebrow is an advanced permanent makeup technique. The artist uses the highest technology machine to draw soft feather-like strokes that look like individual hairs. These hairstrokes are blended with existing hair for a natural look or create a shapely brow from little or no hair at all. The space between the top of the eye and the brows, the fullness of the shape of the face, how large or small the eyes are, the amount of hair present, hair growth pattern, type of skin, and the color desired are all considered to perform microblade hairstroke for eyebrows. Eyebrows are the most important part of a person’s facial appearance. The ultimate perfect brows will bring you higher self-esteem and more confidence; necessary ingredients for success in your career and in your personal life. A well-shaped, well-place brow can make the face look thinner, more polished and can make eyes look wider. Some women and men suffer from a condition called alopecia which can cause loss of all body hair, including the hair from eyebrows, that may never regrow. Loss of eyebrow hair or imperfect brows can result in feelings of unattractiveness and diminished happiness in one’s life. 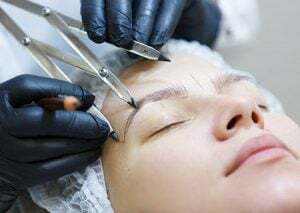 Permanent makeup Full Powder-fill Eyebrows refines the definition to the face and restores eyebrows by giving the right color and shape, helping to camouflage the less-desirable condition. Our professional technicians will help by designing the unique perfect brow to fit your unique face. This includes sizing, shaping and color selection to give the ultimate look. We draw the design and proceed with the permanent application only upon your approval. We use the latest technology machine to apply thousands of tiny dots of pigment, gradually building up a color and defined shape.